A true Yellowstone River treasure with forty acres and Yellowstone River frontage. Located between Livingston and Yellowstone National Park. This home has wireless Internet, satellite TV, and air conditioning. This property has six separate beds for groups of fishermen and will sleep up to 8 guests. Brief Description: This four bedroom home is located on forty private acres, about 20 minutes south of Livingston. The home has a beautiful and private yard with wide-open mountain views and great access to the Yellowstone River. From just about everywhere in the house you can see the Yellowstone River flowing by. Bedrooms and baths: There are four tastefully decorated bedrooms and 4.5 bathrooms. The master bedroom has a king size bed and a large attached bath with a separate tub and shower. The north end of the house has a guest wing with two additional bedrooms, one with a queen size bed and the other with two twins. Both of these rooms have their own baths with tub/shower combos. Each of these three bedrooms has a door leading to a private patio with river views. Upstairs is a private room with a queen sofa sleeper and a full size bed, television and a private bath with a stall shower. There is a half bathroom off the living room. Kitchen: This fully equipped kitchen has high quality appliances and amenities. It has absolutely everything you will need for any meal you have planned. There is a nice selection of cookware, serving ware and a good spice cabinet as well. It's a large kitchen with a round table in the middle; a great place to enjoy your morning coffee and visit with the chef in your group. Out on the patio, you will find a gas barbecue grill and seating for outdoor meals. Dining area: The spacious dining room adjoins the kitchen with a beautiful, large table that seats up to eight guests. A rock fireplace is a focal point in the dining room. The fireplace rock wraps around the corner into the living room with a second fireplace. Living room: The living room features large windows to take in the views, and a window bench provides a great spot for an afternoon of reading. The furniture is situated around a large wood-burning fireplace for evening get togethers or for TV watching. Cozy sofas and chairs are set to enjoy the gorgeous views of the Absaroka Mountains. The open space of this home is great for gathering after your days adventures. Setting, acreage, views: This home is located on forty private acres. The rugged Absaroka Mountain Range is nearly all you can see from the home! A path is maintained from the house to the river, just a short walk out the back door. 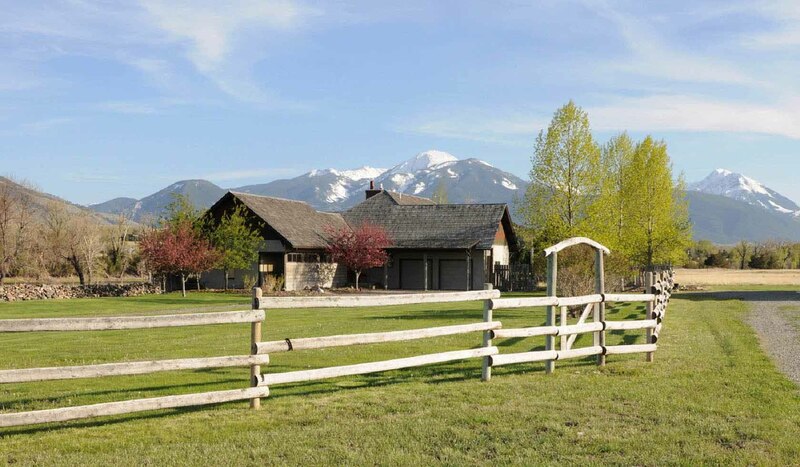 Activities nearby: Besides hiking and mountain biking on nearby trails, there is fishing, horseback riding, rafting, golf, tours of Yellowstone National Park and everything that the towns of Livingston, Gardiner and Bozeman have to offer. For an especially memorable experience in the park, book a specialized private tour with our sister company, Greater Yellowstone Guides. Chico Hot Springs is about 7 miles from the home. Closest town and airport: It's about 20 miles to Livingston and 40 miles to Gardiner. Bozeman's Gallatin Field airport is about one hour from the home.